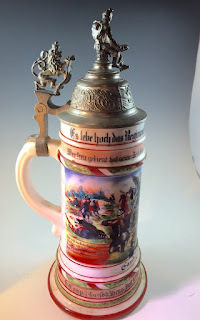 What Exactly is a German Regimental Beer Stein: is it Real or Repro? How did I get here? Re-roll the tape to 1957, when a little kid from California is uprooted and transplanted to Germany with her family. My dad was in the Air Force, a code breaker during the cold war. I had no idea what he did for a living until 20 years after he retired. I just knew it was top secret and all very hush hush. Seriously, what 8 year old in the known universe cares about what the parental units do when they are out of sight?